Booking a One Day Intense Course? Has your friend got a birthday coming up in the next few weeks? Or is your sibling a real motorhead and getting married in the new year? If you want to get them the gift of a lifetime, Phil Price Rally School offer incredible One Day Intense Courses that are the perfect present for any occasion. Our action-packed 7 hours courses take place in fully prepared rally cars with super passionate instructors who can teach you everything they know. With unrivalled driving time, your loved-one can experience rally driving like never before and get to see how the professionals do it! All driving will take place behind the wheel of a Subaru Impreza. With its sporty curves and blue and yellow colouring, this type of rally car is instantly recognisable. The series was launched in 1992, after which a Subaru Impreza WRX ended up winning the World Rally Championships three times in a row. 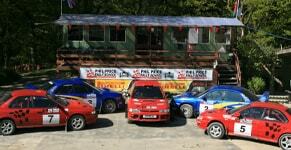 Choose Phil Price Rally School and they’ll enjoy a top venue, highly experienced instructors and a wonderful buffet lunch. We pride ourselves on offering excellent value for money. Our driving days are also brilliant fun for spectators, so you can join in the fun too! 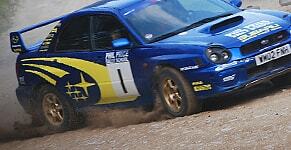 An action packed day giving you the real chance of driving rally cars on genuine forest stages. Perfect for Team Building or for a group of family/friends for an exciting and competitive day out.